1. Preheat your oven to 160°C/R3. 2. Cook the pasta according to the packet instructions then drain well. 3. Meanwhile, spray a large non-stick frying pan with low calorie cooking spray and place over a medium heat. Add the onion, garlic and chilli and stir-fry for 3-4 minutes or until softened. Add the passata, season to taste and stir. 4. Simmer gently for 2-3 minutes, stirring occasionally, then stir in the peas and remove from the heat. 5. Tip the pasta into a medium-sized baking dish. Pour in the tomato sauce and toss well to coat the pasta. Scatter over the mozzarella and bake for 12-15 minutes. 6. Grind over a little black pepper, scatter over the basil leaves and serve hot with salad. Recipes taken from Slimming World’s Veggie Deluxe, which is available in all Slimming World groups now and priced at £4.95. Find Slimming World online or call 0844 897 8000 to find your nearest group. Photo: Slimming World’s Veggie Deluxe/Gareth Morgans. Creamy coconut with a spicy kick – West Indian cooking at its very best! 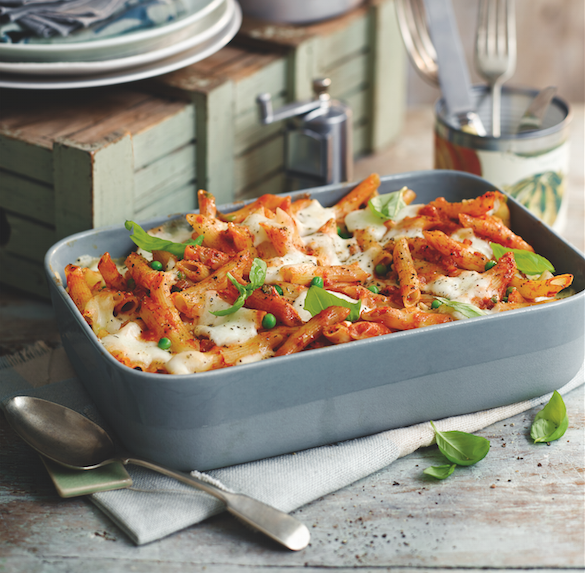 Flavour-packed, filling and ready in next to no time, this easy dish ticks all the boxes!